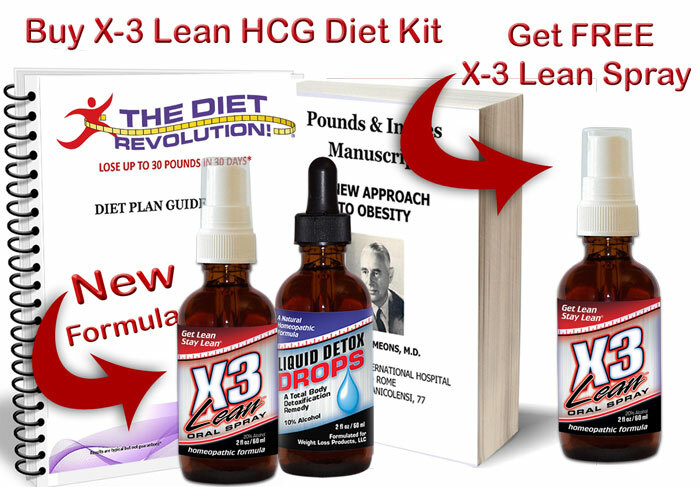 Have you heard of the HCG Diet using the X-3 Lean HCG Spray? On the average, women lose 15 - 25 lbs a month and men lose 20 - 30 lbs a month! People are losing weight FAST! History has proven you do not have to exercise on the HCG diet in order to lose abnormal fat, but it is perfectly fine to do continue with a moderate exercise program if desired . Get optimum weight loss results, add either the Basic HCG Diet Support Kit or the Ultimate HCG Diet Support Kit. The HCG X-3 Lean Kit contains real homeopathic hCG and additional homeopathic ingredients designed to increase metabolism and help burn off excess, abnormal fat using many HPUS approved (meaning they have been proven to successfully treat specific conditions) homeopathic ingredients to treat conditions such as compulsive and binge eating and decrease cravings for sugar/starches and greasy foods. Many people on the HCG Diet claim they are not hungry and rapidly lose abnormal fat each week. A complete e-guideline packet is emailed to you with more complete instructions, all the foods you can eat on the diet, as well as great tips to help you through the plan - like what to order when you eat out. HCG Diet dates back to the 1950s when a British endocrinologist, Dr. ATW Simeons, pioneered the theory of the hCG Diet to help people lose abnormal fat. hCG is actually the abbreviation for Human Chorionic Gonadotropin, which is a protein hormone naturally produced in the placenta during pregnancy at extremely high levels. hCG acts as a pre-cursor to support better function of the hypothalamus gland, which is the master gland that controls metabolism, the loss of abnormal fat, sleep, thirst, hunger, blood pressure, and other body functions, just to name a few. Stress, accidents, head injuries, yo-yo dieting are some of the things that can contribute to a malfunctioning hypothalamus. These can be the main factors contributing to abnormal fat storage that can become almost impossible to lose. Using extremely small amounts of hCG, like in our homeopathic HCG X-3 Lean, along with a balanced, low fat diet of specific foods, helps the body begin utilizing the stored abnormal fat that otherwise it cannot use! People on the hCG diet have discovered it is the simplest, fastest way to lose anywhere from 15 - 30 pounds a month. Because the hypothalamus and metabolism function better after the HCG Diet, they also keep the weight off better. There are some important considerations when following the HCG Diet and these are to get adequate electrolytes with Super Min-Plex - like in the Basic Diet Support Kit, detox with either Liquid Detox drops or a Detox Kit before during and after the diet,. Realize emotions are also involved when losing weight because of the fear of gaining it back and the HCG X-3 Lean Spray contains homeopathic Flower Essence to curb emotions. Our products and kits set us apart from any other HCG Diet Program. Starting with either the HCG Diet X-3 Lean Spray or the HCG Ultra Max Drops, both are homeopathic formulas made in a FDA registered lab that contain real hCG, along with 21 additional specific homeopathic ingredients in order to help people get the best results with the diet (for more details, click on the INGREDIENT tab). Since the HCG Diet is virtually fat free, you must not use body products containing absorbable oils. (they react the same as eating fat). 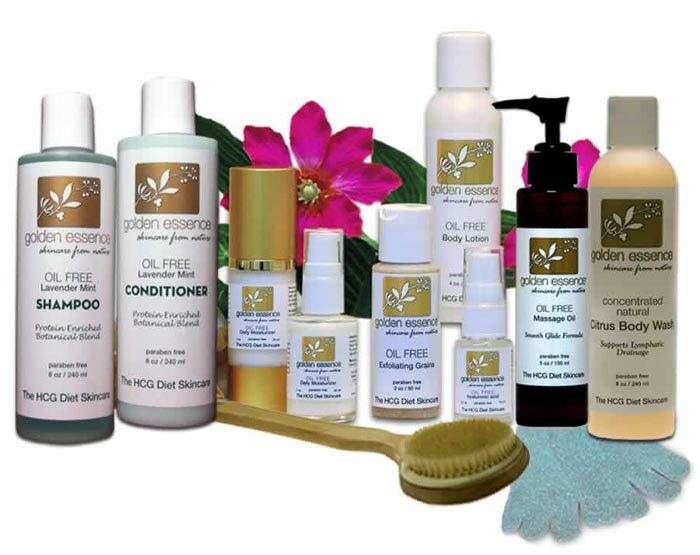 We have a complete line of natural, oil free skincare products to ensure your ultimate success. To see the see the full line of HCG DIet. Oil-free skincare products, CLICK HERE. To view more details about the ingredients, click on the "Ingredients" tab. 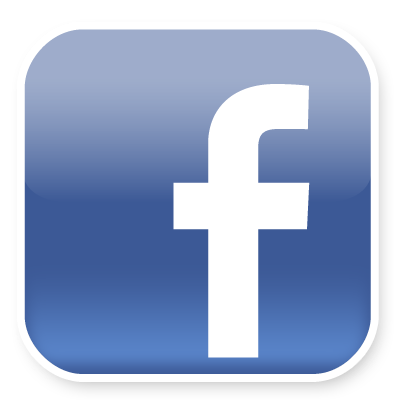 To view details of what is included, click on "What's in the Box". For full benefits of the HCG Diet Plan, add one of the Diet Support Kits that you can find HERE. 4 specific additional Amino acids that help detox waste and ammonia, transport fatty acids into cell mitochondria, help burn fat during exercise and help support muscle tissue integrity. Walnut – Stabilizes during periods of transition, eases process of letting go and starting ‘anew’. Inactive Ingredients: Purified active water, 20% ethyl alcohol. Contains no starch, salt, preservatives, wheat, yeast or milk derivatives. Store in a cool dry place after opening. Free of toxic preservatives. NEVER tested on animals. Liquid Detox Drops provides homeopathic drainage of excretory pathways and tonification of organ systems. Active Homeopathic Ingredients: Citrus Limonum, Taraxacum Officinale, Uva-Ursi, Berberis Vulgaris, Capsicum, Galium Aparine, Lobelia Inflata, Nux Vomica, Schisandra, Tylophora, Brain, Cor Suis, Glandula Suprarenalis Suis, Hepar, hepar Sulphuris Calcareum, Intestine, Kidney, Lacticum Acidum, Lung, Lymph, Mag Phos, Spleen, Thyrodinum. Inactive Ingredients: Alcohol USP 10%, Glycerin, Purified Water. Contains no starch, salt, preservatives, wheat, yeast or milk derivatives. For best use, use the X-3 Lean Diet Kit along with the NEW B-Max liquid B Vitamins that contains ingredients that helps the body process fats; the synthesis of carbohydrates; the manufacturer neurotransmitters that convert to serotonin and dopamine; the support of nerve function; depression; and flow of electrolytes. E-Guideline directions and e-Pounds and Inches will be e-mailed to you within 5 to 7 hours after your purchase. You will receive an email with your e-books shortly after your purchase.